March 27, 2015 By Clive Tonge There have been 18 pageviews. Province will be Assisting Low-Income Ontarians with Electricity Costs. Ontario is helping make electricity more affordable for families by removing the Debt Retirement Charge for all residential consumers and introducing the Ontario Electricity Support Program for low-income families. 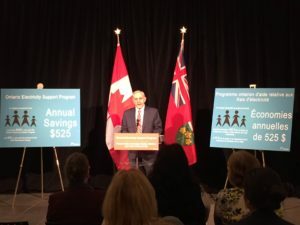 The proposed program, administered through the Ontario Energy Board, would come into effect on January 1, 2016 and would help low-income Ontarians by providing them with financial assistance. Qualifying individuals could be eligible for a $20 to $50 monthly credit based on the size of the household and income. For example, a family of four with an annual income of less than $28,000, would be eligible for a $38 monthly credit — a total of about $455 per year. In addition, the Debt Retirement Charge for all residential consumers will be removed from the bill. Helping low-income households with the cost of electricity is part of the government’s economic plan for Ontario. The four-part plan is building Ontario up by investing in people’s talents and skills, building new public infrastructure like roads and transit, creating a dynamic, supportive environment where business thrives and building a secure savings plan so everyone can afford to retire.